We did it! 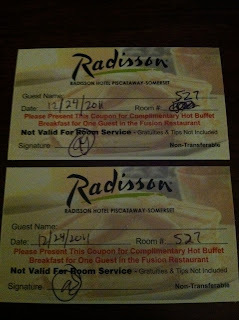 We completed round 2 of the Radisson Big Night Giveaway, earning Kevin’s Club Carlson account 50,000 bonus points (not posted yet, but I can assume it will post within a week or so). 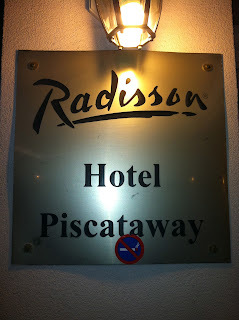 We completed a stay at the Radisson in Piscataway, NJ this past Friday. So why did we decide to book this property? Well for one thing, it was about half way between my parents’ house and our apartment, making the Christmas Eve commute a bit better. Most importantly, we were able to reserve this room using Radisson’s 30% off coupon, bringing the room down to about $81 including taxes (plus, I booked it using MrRebates.com, which will get me a few bucks back too). My parents also joined us for the night (also on the quest for an additional 50,000 points of their own), so we used it as an excuse for us to get together as a family, killing two birds with one stone. Boom. Overall we were very impressed with the property. Check in was quick and easy, and my parents and Kevin and I both got rooms on the 5th floor, away from all of the noise from a convention that was taking place. The manager also gave us complimentary hot breakfast tickets because of Kevin’s elite status (I matched the status with a free Gold Marriott status he had; more information about that in my earlier post here). Kevin was very familiar with the area, because coincidently, his old office was located directly across the street from the hotel. We decided it would be nice to grab some dinner with my parents at a local Korean BBQ restaurant he recommended. Dinner was fun, and when Kevin & I returned back to the room, we relaxed with a nice bottle of Chardonnay and called it a night. We slept well (my next bed will definitely, without a doubt, be a California king), and after breakfast the next morning, we checked out quickly and were on our way to our Christmas Eve festivities. 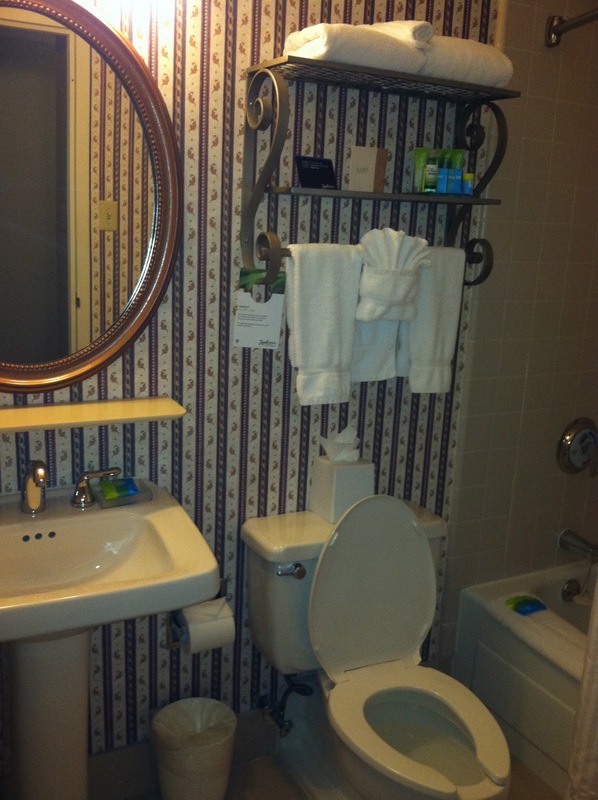 Below are some pictures of our stay. Enjoy! The Radisson in Piscataway, NJ is a category 1 Club Carlson property; however, don’t let that deceive you. The hotel is spacious, clean, quiet, and nice. The only downside was its location, which was among many office buildings in an isolated area, but it is located right off of 287, the main highway. 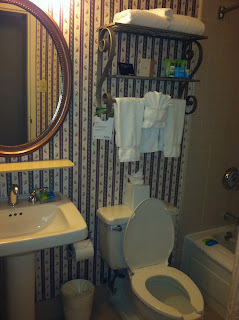 The bathroom was basic, but very clean and packed with an array of toiletries. 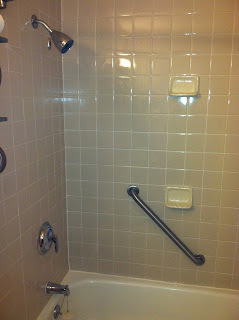 The shower was squeaky clean, and the shower head had great water pressure. 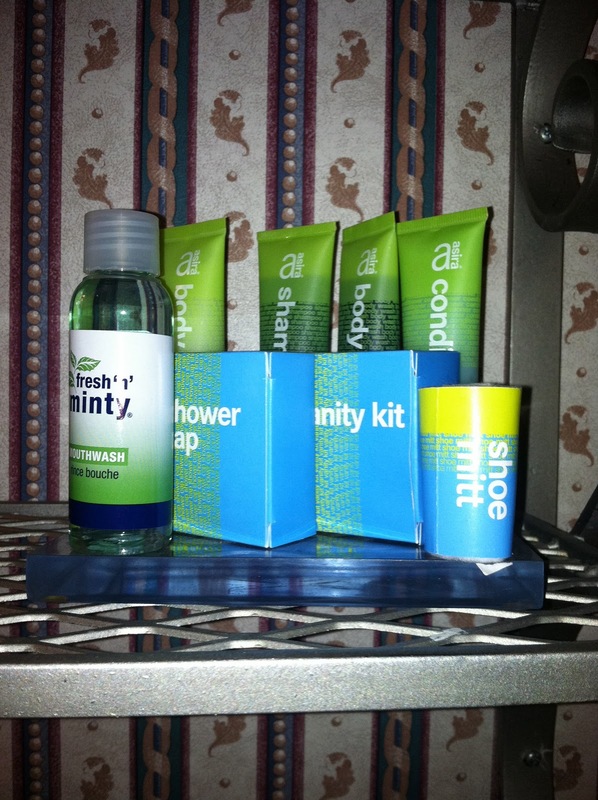 Some of the bathroom toiletries: mouthwash, a shower cap, amenity kit (cotton swabs, a nail file, and cotton balls), shoe mitt, body wash, body lotion, shampoo, and conditioner. 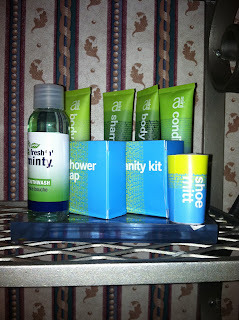 The mouthwash was weak, and I did not use any of the bath products only because I am a slave to my beauty routine and used my own that I have packed from home. Here is the remote for the Sleep Number bed along with instructions on how to use it. 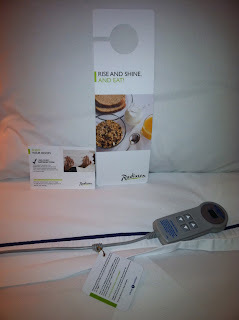 Just FYI, useless information, my “Sleep Number” was 30, and Kevin’s was 35. As you can see, we both prefer a softer bed (and a high heat setting, whew, less arguments there). The desk was stocked with a Keurig machine, microwave popcorn, and Milano cookies. Inside the fridge (to the left, not pictured), there were 2 complimentary bottles of water. 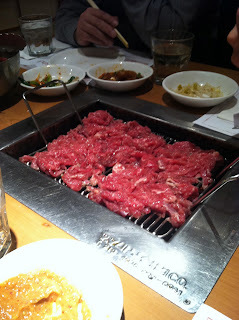 Kevin and I took my parents to an authentic Korean BBQ restaurant only 4 miles away from the hotel! Above is a picture of bulgogi being cooked right at our table. Yum! 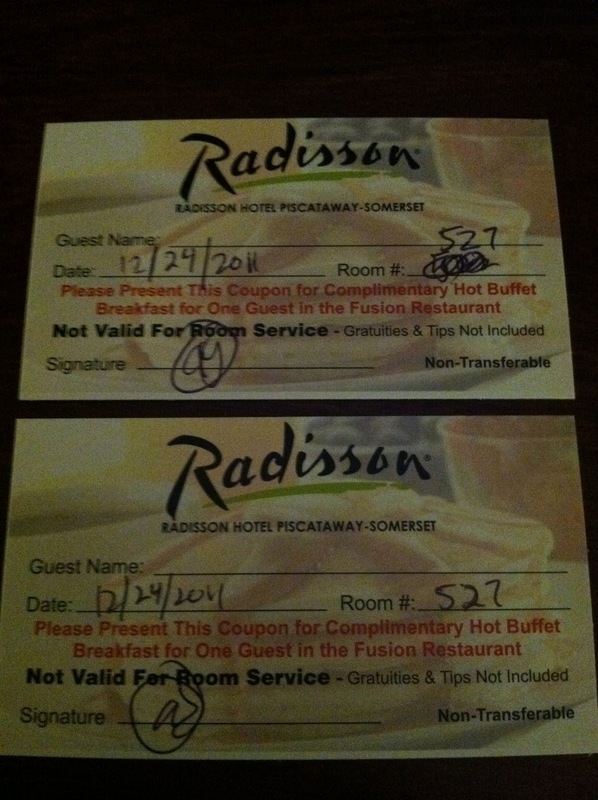 Management gave us complimentary breakfast buffet tickets to use at their in-house restaurant, Fusions. Club Carlson matched Kevin’s Marriott Gold to their Silver elite status. We arrived at breakfast at around 9:40, 20 minutes before closing, so most of the food from the hot buffet was being put away. The waitstaff and chef were nice enough to offer to cook us fresh omelets instead. Here is my very large spinach and feta omelet which was delicious. The service was fantastic; they really did go out of their way to make sure we were happy and well-fed. I just found this site and I think it's great. I also did a mattress run at the Radisson in Carteret. Thanks for stopping by! I was also considering Cateret too… instead, we did Freehold & Piscataway because of the price/coupon code available. Hope your stay was great! Wow, a keurig machine in a room, that would be a first for me, cool!